The point of all this complaining is this: Do any of you readers really give a crap about these videos? Because if no one cares, I'm just going to save myself the aggravation and stop doing them. Please leave a "Yes please keep doing them/ No don't bother" comment either here or on my other blog. Enjoy the video, and leave me a comment about it either here, on my personal blog, or on my YouTube channel. Some of you may have noticed the Apocabox advertisement to the right; I am an affiliate members now, so clicking on that link (or this one) gets me a little bit of cash, so if you're inclined to find out more, please use my link. A lot of chemistry occurs while the components are suspended in a neutral carrier that doesn't add anything to the reaction, but merely allows it to happen.These are called solutions. If you add table salt (NaCl) to a cup of water, it will dissolve. This is a simple solution where the water is the solvent and the NaCl is the solute. Solvents come in two forms, polar and non-polar. Water is a polar solvent due to the lop-sided shape of the water molecule. It has one end with a more negative charge and the other end has a more positive charge, like a magnet. Polar solvents work best to dissolve ionic molecules. Non-polar solvents have a more balanced charge across the molecule and tend to be less conductive of electricity. Most petroleum products are non-polar and also make good electrical insulators, which is why large transformers are filled with oil. There are limits to how much NaCl you can dissolve in water depending on the temperature of the solvent, technically known as the solubility. Most common tables of properties (found in reference books) will give solubility in water. Wikipedia has a solubility table for many common chemicals. Solutions are generally easy to separate, evaporation of the solvent (paint drying is one example) is a common method. Ionic compounds like NaCl dissociate into their ions in solution, but reform when the solvent is removed. This comes in handy when you need to replace an ionic component with something more useful. Solubility is a common method used to separate out a compound formed in a solution. Using black powder as an example; most DIY recipes for black powder start with the potassium nitrate and how to make it. If you have access to caves full of guano (bat excrement that has been anaerobically digested by nitrifying bacteria) or manure piles that are over a year old (same bacterial action) you have a source of ammonium nitrate (NH4NO3) which has a solubility of about 240g/100g of H2O at room temperature. Rinsing the source material with water to dissolve the NH4NO3 and then adding potassium hydroxide, commonly known as lye, (KOH) will produce potassium nitrate (KNO3) and ammonium hydroxide (NH4OH). KNO3 has a solubility of only 43g/100g H2O at room temperature, about a fifth of NH4NO3. Evaporating off the water will cause the ratio of solute/solvent to shift higher and once the solubility for the ambient temperature has been reached, the solute will begin to form crystals that fall out of solution (precipitate). This means that KNO3 will precipitate out of solution as crystals long before any leftover NH4NO3 would, making it easy to separate out of the liquid with a paper filter. Distillation uses the differences in boiling/condensation point to separate the liquids. Most petroleum products are “fractioned” out of crude oil through distillation. Freezing uses the differences in freezing points to separate components. Sea water can be made drinkable by freezing it and melting the top layer of ice since salt water freezes at a lower temperature than fresh water. Membrane technology, of which reverse osmosis is one form, allows only one part of the solution to pass through. Centrifuges use the differences in liquid densities to separate them. If you've ever seen a cream separator, with its stack of spinning plates, then you've seen a centrifuge. Spinning a liquid will cause the more dense portion to move towards the outside of the container, while the less dense portion will remain closer to the center. Adsorption is a method that uses a material with a chemical affinity for some of the portions but not the others. Activated charcoal is an adsorption filter that most of us are used to seeing in water purification. Ethyl alcohol (grain alcohol) is one of the inevitable exceptions, as it forms an azeotrope where the water molecules get locked into the alcohol molecules. This is why distillation of fuel alcohol gets tricky as you approach 90% pure alcohol: to get above 90% pure grain alcohol, you'll need to use something with a stronger affinity for water than the alcohol has. Concentrated sulfuric acid and adsorption media are the most common methods of making 100% pure (anhydrous) ethyl alcohol. Fortunately, most engines will run on alcohol that is 65% or more pure, so simple distillation will suffice for making fuel. Next week, I'll get into ways of measuring the parts of a solution, so get ready for some math and constants that don't make a whole lot of sense to common folks. Just remember that chemistry was started by alchemists, and really only took off because of competition between chemists who used systems of measurement and naming that were designed to keep their work hard to understand. 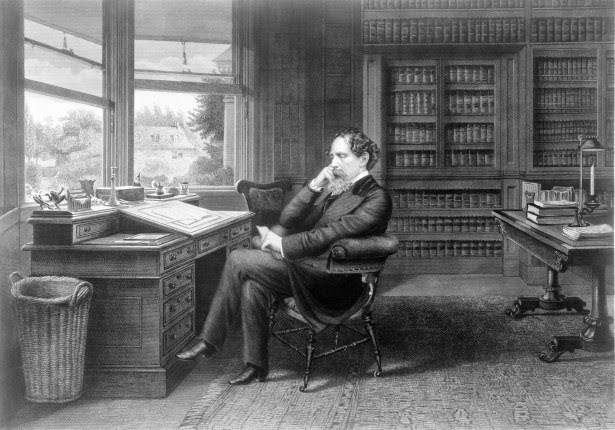 Being the first to isolate an element or refine a useful compound was their way to get into the history books, so they put some effort into secrecy. In the search for things to take for lunch and items to add to my Get Home Bag, I always check both the discount grocery outlets as well as my favorite odd item source, Trader Joe's. These are what I found at TJ's. This is a 10.5 oz. 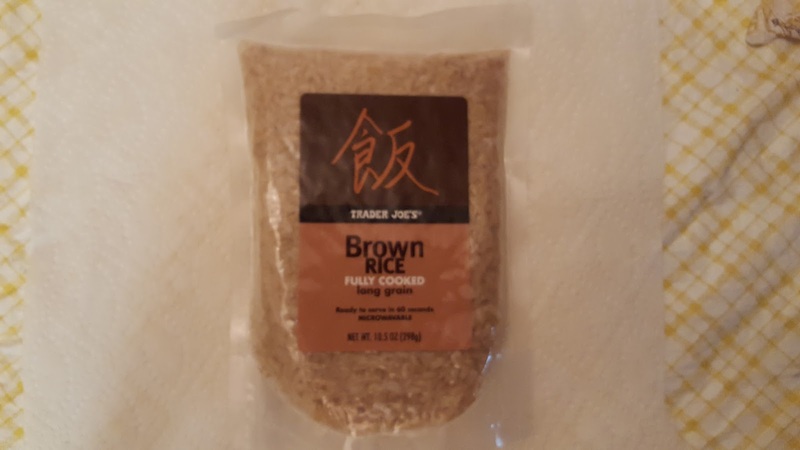 package of fully cooked, long grain brown rice in a package that, after opening, can be placed straight into a microwave. I have tried cooking it that way and found that a small amount of water needs to be added to soften the rice, as it is very chewy and dry without it. It tastes like proper brown rice, and I've used it as a base for vegetables, meat and fish in my weekly lunch menu. Also, when I'm too tired to cook much for dinner, the ease of grabbing a bag and microwaving it for 90 seconds is a nice change from a 10 minute wait for a potato. There is no printed expiration date on the package, but I don't plan on keeping this in my bag longer than two months, especially as the weather starts to warm up. I have two packages in my GHB, where they will be an extender to the chicken and tuna already there, if there is the need to share what I've packed. These are 17 oz. boxes of liquid soup in what a supermarket clerk tells me are but two of at least six different flavors that have been on their store shelves over the last three months. I don't usually look at the soup aisle, but the last time I was there I went all the way to the end and found these two. The boxes open in a novel (to me) fashion: you lift two tabs on the narrow sides of the box, squeeze the narrow corners together (marked in black at the top of box) then tear the box open along the dotted line. Pour, heat and serve! The boxes fit well into my 6 Pak cooler lunch box, leaving plenty of room for a bowl to heat it in, sandwich, water bottles, fruit and blue ice. Flavors for both soups were great, and there were a surprising amount of large chunks of chicken in the Chicken Corn Chowder. The Pinto and Poblano soup is pretty much what it sounds like: bean soup with mild Mexican spices. I plan on going back to purchase more of these, and see if there are any new ones on the shelf. 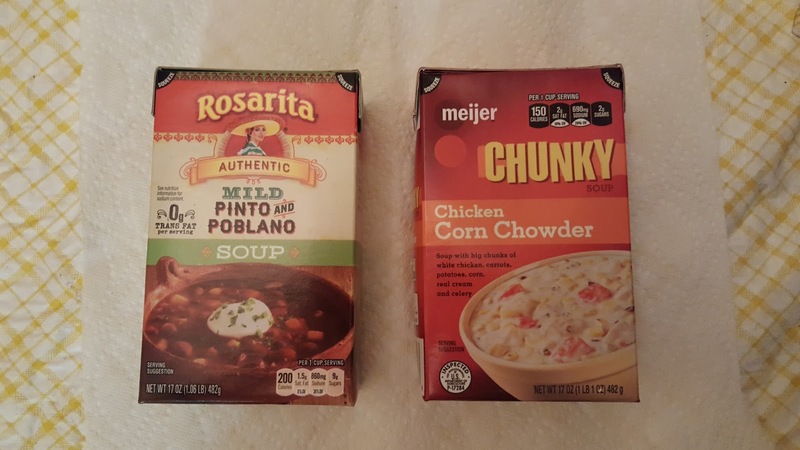 The expiration dates on the boxes say late summer 2016, and while they seem strong enough, I do not plan to put soup boxes into my GHB (I am not lucky. Really, really not lucky), so this is strictly a weekday lunch item for me. I need to do more 'shopping' when I go to the store. I have potentially walked past perfect additions to my gear and never noticed. Unfortunately, I lost the two receipts for the tested items. I will post a correction to the blog with accurate prices as soon as I can. We're rapidly coming up on the time when folks start to venture out into the wilds. This is a great thing, but it always results in folks getting stranded in the middle of nowhere. Most of these folks are found unharmed, but sometimes the outcome is disastrous. A few simple things can ensure you stay on the unharmed side of disaster. GPS is a wonderful creation, but it has led to folks getting lazy. Spend a bit of time with an actual map if you're unfamiliar with the area. Call ahead and get local information if you can; an hour of homework can save you a cold night in the sticks. And make sure someone else knows your route, when you're leaving, and when you expect to arrive; that way they can send help when you don't show up. If something feels a bit off, stop and assess the situation. Check your map against your GPS to see if you're being led astray; if you can't find answers that fully satisfy you, turn around and go back. Gambling on what's at the end of the road isn't worth your life. Your vehicle has all your supplies in it, even things you might not suspect that you'll need if you set out in search of help. You can only carry so much, so leaving means deciding which gear you aren't willing or able to carry. A car or truck is also much larger and easier to find than a human. As an example, when viewed from the top, I occupy about 2 square feet. My truck, however, occupies almost 116 square feet. Cars are large enough that Google Earth captures images of them on satellites every day, so something of that size is comparatively easy to find in an aerial search, especially when compared to a standing human. The vehicle is also a resource in and of itself. It is a ready-to-go shelter from the elements, and even contains a very efficient heater. (Make sure your exhaust pipe is clear before you idle the engine, though, and only run it for short periods. This will extend your fuel dramatically, as well as lowering your risk of carbon monoxide poisoning). Opening the windows very slightly will allow fresh air in, which is also helpful. Next week, we'll look at ways to improve your odds if you do have to strike out from your rig. In the survival world there are lots of premium “end of the world” and “if you could carry ONLY ONE KNIFE” type knives out there. As an owner of Busse Combat, Swamprat, and Scrapyard knives, as well as Ranger Knives and a few Ontario milspec over the years, I have come to the following conclusion: You don’t want just one knife for the end of the world. That “one knife” solution ends up being a sharpened crowbar which is less precise at fine tasks and less than ideal for hacking tasks. Yes, they work, but they are generally expensive, heavy, and not very user-friendly. The solution is to have three knives, aka the Nessmuk Trio. 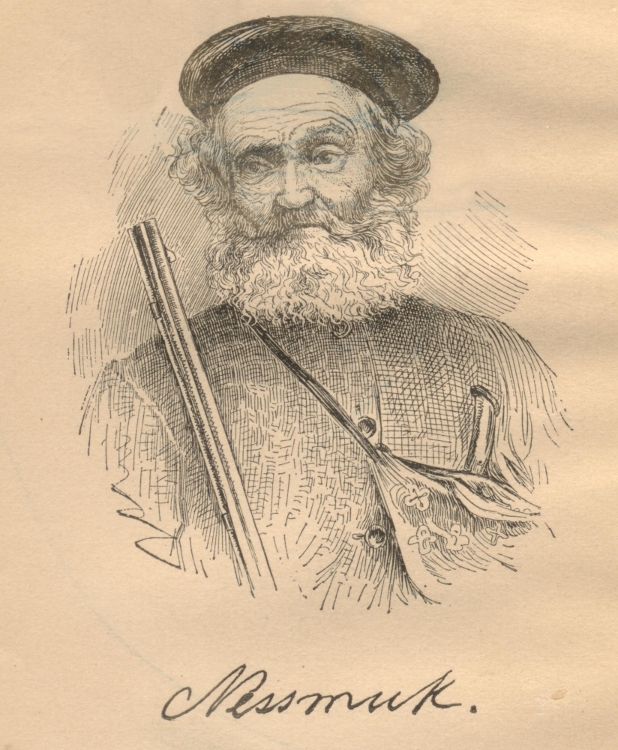 Named after author George Washington Sears who wrote articles for Forest and Stream magazine in the 1880s under the pseudonym Nessmuk, the trio is an efficient minimum for survival chores: an axe or hatchet for chopping; a large knife for skinning and butchering; and a small knife for precise work. 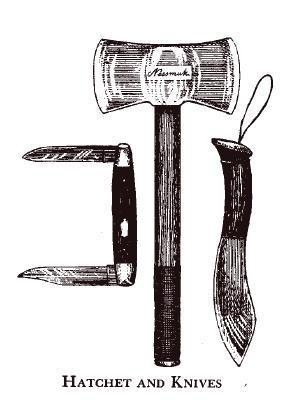 I like the Husqvarna brand, and your choices range in size from the 13” hatchet to the 21" carpenter's hatchet to the 26" multipurpose axe. 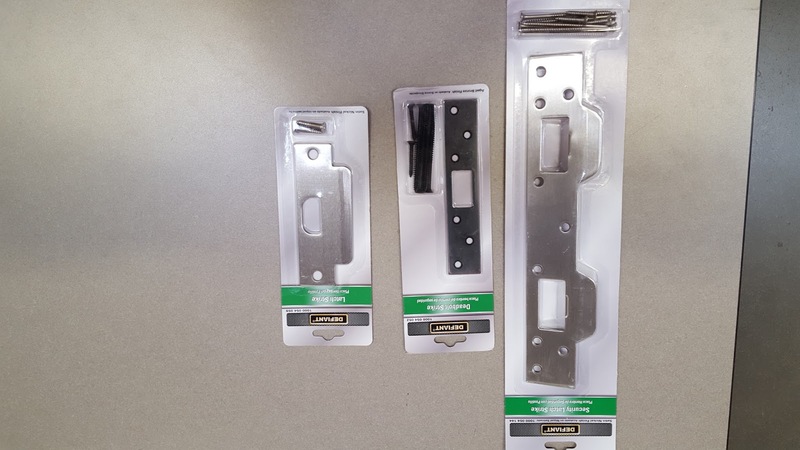 If a handle breaks, you can make or buy a replacement fairly easily, and this is the reason why Fiskars and Gerber brands are not recommended. Eastwing is made in America, but the head geometry of Eastwing hatchets leaves a bit to be desired in my experience. I suggest going bigger on the axe if you have the space for it, and the 26" multipurpose axe is the one I would want in a long-term survival situation. For a shorter period, though, any will do. For the large skinning and butchering knife, get a Dexter Russel 6" sani-safe commercial butchering knife (8" version here). This knife will handle butchering chores as well as food prep without any issues. At $25, it's a bargain. I honestly think that either the 8 or 6 inch blade will do just fine for preparing food for one person, but an 8” blade is better for most cooking chores involving a family or group meal. The Mora Companion is an inexpensive favorite of preppers everywhere. This knife will handle pretty much any utility knife task you throw at it . Costing only $15, if you don’t own one, you should. The last time I was in Afghanistan, my Mora Companion became my favorite fixed- blade knife. Image source unknown; found unattributed on internet. So there you have it: an axe that costs between 30 and 60 dollars, a butchering knife for 25 dollars, and a Mora Companion for 15 dollars. 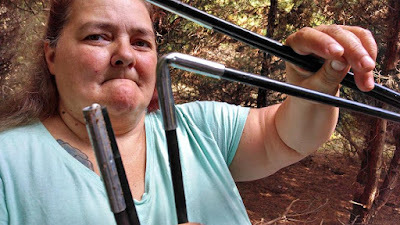 For 70 to 100 dollars (plus however much you pay for shipping) you can have three tools that will outperform any single “end of the world” sharpened crowbar on the planet. First, I need to give a word of warning: Chemistry follows rules, but there are almost always exceptions to those rules. I will try to point out exceptions as they occur to me, but my memory is not perfect and I may miss some. If I make a mistake, please let me know so I can correct it; my ego is not so large that I am unwilling to admit that I can make mistakes. 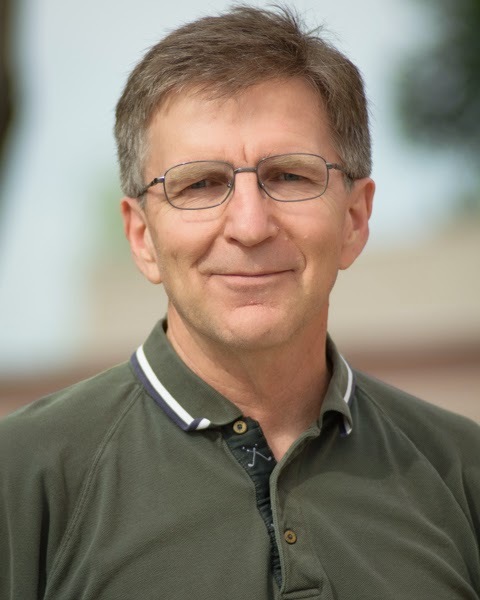 I studied Chemistry for three years in college, but that was almost 30 years ago; my interest and desire to learn have kept me dabbling in chemistry for many years, and the various jobs I've had over those many years have taught me more than college did. I am also struggling with subscript and superscript in the blog format, without resorting to writing the whole mess in HTML. If I ever figure out how to properly represent molecular formulas, I will. Until then you'll have to put up with the mess along with me. Last week I covered atoms, which are the smallest pieces that elements can be divided into and still retain their physical and chemical properties. Start adding or subtracting protons and you're creating a different element; add or subtract neutrons and you're creating isotopes; electrons bounce around between atoms creating ions. All three will act differently, physically and chemically, than the atom you started with. Atoms are the base of chemistry, but molecules are what we work with. When atoms get together and share electrons, they create molecules. I mentioned electron shells briefly last week, and how there are a series of shells around the atomic nucleus with each shell capable of holding a set number of electrons. The shells tend to (almost always, but there are exceptions) fill completely before electrons start orbiting in the next higher shell. Thus, the outer shell is the one with the “available” electrons or “available” spaces for electrons, since it is the one that is not full (except for the Noble Gasses, with their full outer shells which don't combine with anything under normal circumstances). These outer electrons are called valence electrons, and are the ones shared in the “bonds” that tie atoms together into molecules. As you go down the Periodic Table, the outer electron shells hold more electrons and it becomes possible for atoms to have several natural valence states, or be polyvalent (more on that when I get to naming and nomenclature). If electrons from one atom are stripped from the outer shell and take up orbit around another atom it is called an ionic bond, because both sides have had their electron/proton balance upset and have become electrically charged. Electrons carry a negative charge, so the atom that gains an electron will become more negatively charged and is known as an anion, while the donor atom will become more positively charged and is known as a cation. My simple way of remembering which is which is, “I like cats, so cats are positive and therefore cations are positively charged”. Those of you who don't like cats will have to use the “an-” part of anion and remember that it means “minus” or “negative”. Anhydrous = without (minus) water, anarchy = without rule, anaerobic = without air, etc. Since opposites attract, the positive and negative ions will stick together like magnets. Ionic bonds are fairly weak and easily broken; dissolving an ionic molecule in a solvent will create a solution of ions. Table salt is a good example of an ionic molecule: NaCl is the chemical formula for table salt, sodium chloride, and if you add NaCl to water, the molecule splits into Na (+) and Cl(-) ions. The Cl atoms have stripped an electron from the Na atoms, ionizing both of them. If electrons are shared equally in pairs between the components of a molecule, it is called a covalent bond. Covalent bonds are strong and stable. Water is a good example of a covalent bond: H2O is the formula for water, two hydrogen atoms bound to a single oxygen atom, and these bonds require an external source of energy to break. Quite a few of the elements exist in a molecular form due to covalent bonds -- Oxygen atoms tend to buddy up and you'll find them as O2 in nature, and Sulfur (or sulphur) tends to gang up in groups of 8 such that the common yellow powder form of sulfur is known as S8. There is a third type of bond, known as a hydrogen bond, that is peculiar to the unique state of hydrogen only having one electron to share but needing two to fill its first and only electron shell. This one is more applicable to the interactions between molecules than those between the atoms that make up molecules. Hydrogen bonds are very weak. If there are more than one bond in a molecule, the bonds will also have an angle between the bonds. If you look up H2O, you'll generally find a molecule that looks like a Mickey Mouse head, with the oxygen atom as Mickey's face and the hydrogen atoms being his ears. This shape is set by the angle of the O-H bonds (104.5 degrees) to each other, which is why you'll often see complex molecules pictured as bizarre tinker-toy constructions. Bond angles are determined by the number of valence electrons available and how many are actually being shared. If you're looking through a chemistry text and see a molecule represented like H-O-H then you're seeing a simple Lewis Structure. Each of the bars (there may be more than one) between the atoms represents two electrons that are being shared in a bond. Unshared or “lone pair” electrons may be shown as dots around the atomic symbols. This system shows the electrons being shared, but not the bond angle. This is an older system that is being replaced with 3D graphical representations in order to relay more details about a molecule's structure. Next week I will be introducing the various categories of chemicals, with reduction/oxidation chemistry, stoichiometry, and reaction potentials in the near future. My CRC Handbook of Chemistry and Physics must be packed away, so I bought an older version on eBay for less than $10, shipped. I'm going to need that for some of my references, and it's handy to have around for the conversion factors in the back (about 40 pages of fine print, how to convert any common unit of measure into any other) and some of the history of chemistry. 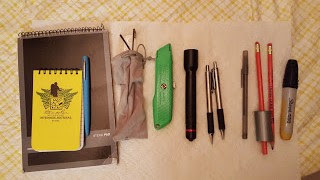 After Erin's segment on The Gun Blog Variety Podcast (a show you should be following) where she discussed her EDC carry items and the novel container that is used, I thought it was time to return to my EDC bag and give an update on what is going on. Lokidude also thought to post on his bag, so it appears we may have started a theme week! As mentioned in my previous post, I am using a 5.11 Rush Moab 6 to carry my work tools. 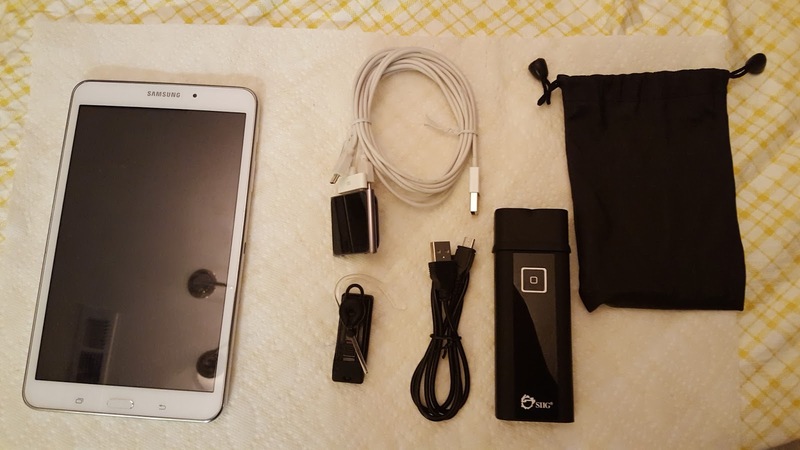 After two months of regular use, this is my report: I really, really like it! Everything fits with plenty of room to spare, I can't easily overload it, and carrying it regularly it is very comfortable. Lokidude mentioned he would like more MOLLE attachment points on his bag, while I would like less! I wanted this bag to be as generic as possible, but the only way to get the storage and quality I really needed was to go tactical, and 5.11 was one of the only brands to allow left-or-right side carry of a sling bag. My previous EDC post is no longer accurate, as I have changed my daily carry arrangement with some items coming out and a few different items going in. I'm now bringing my tablet to work for lunchtime reading and have retired my Nook to use at home, mostly reading in bed. The SIIG light/backup battery is the biggest change, as I now have a way to charge all my electronics. I have a larger notebook than before, but the small Rite in the Rain stays the same, as does the write-anywhere pen. A standard utility knife is in the bag now, replacing the auto-retract model. A spare Zebra pen and pencil; cheap stick pen; two pencils; wide tip magic marker; and a small amount of duct tape wound on the second pencil. All of the items shown above are very easily stored in the designated pockets and slots. 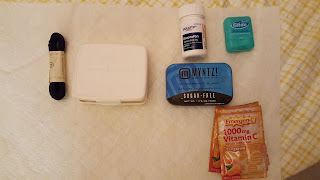 A very small First Aid kit, with triple antibiotic and band-aid assortment. Sugar-free mints, to fix coffee breath. A small bottle of hand sanitizer, which just ran out and needs to be replaced. This pocket is also large enough to carry all my paperwork and plans for the week without becoming overstuffed, which is important since when I'm working, my bag is usually kept in a basket that holds my large tools: pliers, pry bar, hammer, mallet and drill. The extra center pocket that might be used for concealed carry in states other than California is not used by me, because California. I really need to see and feel items to be able to make wise shopping decisions. Online pictures can't give me enough info to make wise choices. Brand names don't guarantee quality, but they can certainly point you in the right direction. SIIG Flashlight/Battery combo from Amazon: $19.99 with Prime. 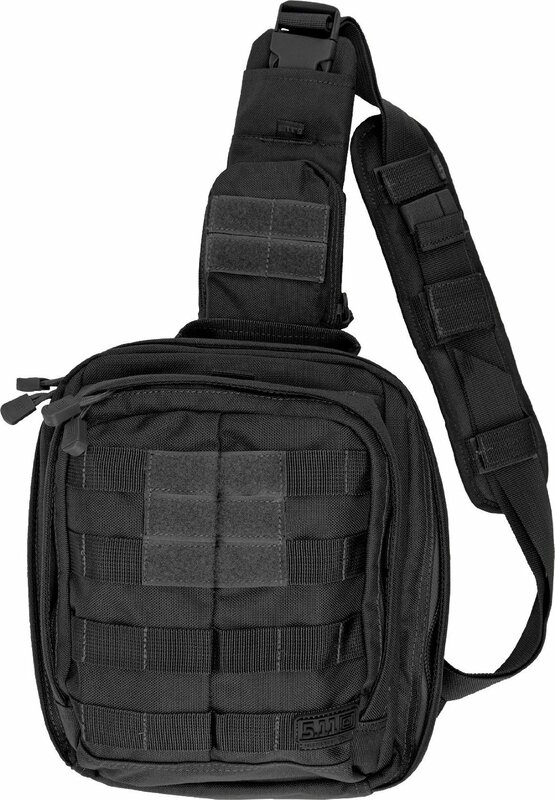 5.11 Rush Moab 6 sling bag from Amazon: $54.04 with Prime. I need to note that last week was my 100th post to Blue Collar Prepping, a milestone I never thought I'd reach. I am not a writer, and if the things you read under my name look and sound coherent, it is from the endless work of our Editor. 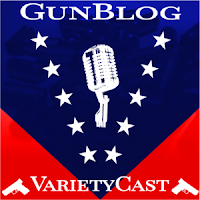 In this week's Gunblog Varietycast, Erin talks about her tactical gadget holster. She also mentions larger bags, which reminded me that while I've mentioned it, I've never actually talked about my Tactical Manbag. It is substantially larger than Erin's bag, but I'm a guy who believes in bigger pockets when you can. 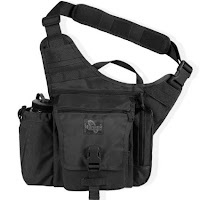 The Tactical Manbag is a Maxpedition KISS bag. It is a sling-style bag with four auxiliary pockets, a large main pocket, a generous concealed-carry pocket, and a water bottle pouch. It's smaller and more convenient than my backpack, without costing me too much of the gear I like to carry day-to-day. The zippered flap pocket holds a Smith's Pocket Pal, a random folding knife of unknown origin, and a Cabela's mini multitool that I got as a white elephant gift but punches way above its weight class. The open pocket in front holds a sole item, a canister of Sabre Red pepper spray. There are some places I cannot carry a gun, and as a rule, I find knife fighting to be a good way to bleed. The same places that bar firearms often don't give a second look at chemical spray. In any case, I'll take any advantage I can get. As I don't like fumbling when I need a weapon, I reserve this pocket for the spray alone. 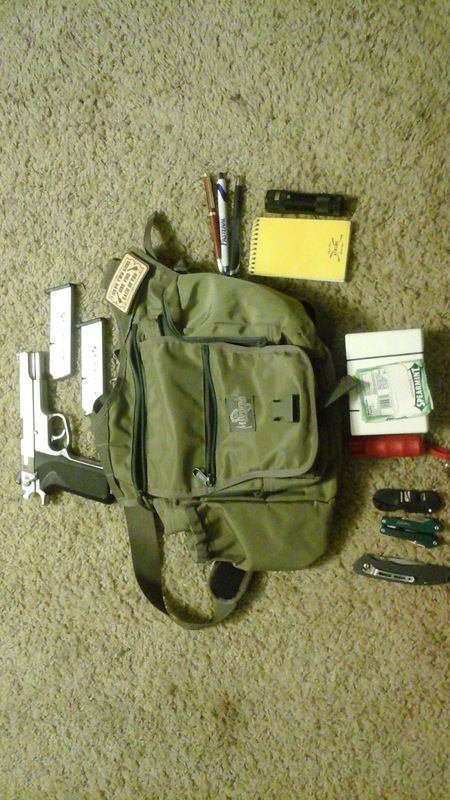 The zippered front pocket holds a smaller version of my fire bag, containing a small cigarette lighter, ferro rod and steel, a few matches, and various tinders. It also is where I keep a pack of gum and possibly mints. The long pocket on the side holds a generic LED flashlight (buy 'em cheap and stack 'em deep), several pens, and a small notepad. It also has room for much more, if needed. The concealed carry pocket readily holds an S&W 1006 and two spare magazines. Size-wise, the 1006 is virtually identical to a Government model 1911. The holster in the pocket is adjustable to fit virtually any gun, and I've tested it with guns down to a compact 9mm. The large center pocket has no dedicated contents, and is reserved for whatever incidentals I may need. It will hold, all at once, my iPod, cell phone, tablet, Limefuel Battery, and any associated cables, with a little room left over. The one fault that could be leveled against the bag is that it has no MOLLE webbing to speak of. Such attachment points would likely be awkward, but for small accessories, they could be useful. Regretfully, I also cannot carry much of a first aid kit with this bag, but could (and should) build a compact unit to fit this smaller size. That's the whole of my EDC bag. 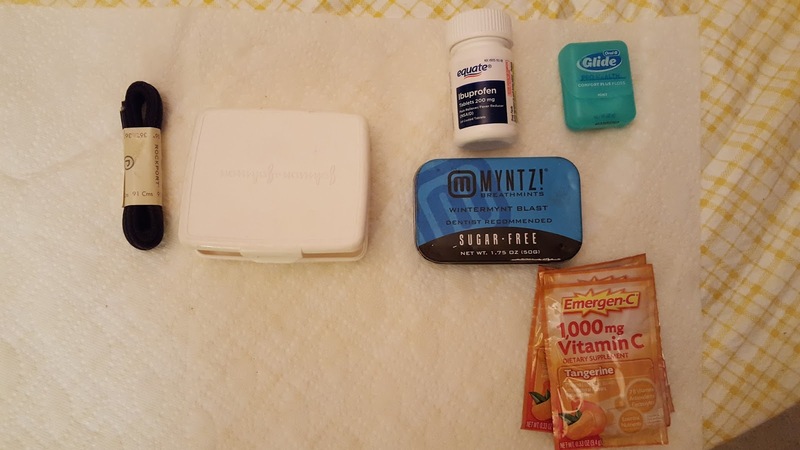 It's everything I could need on an average day, without putting so much in my pockets that my jeans fall down. While off-body is obviously not ideal for certain circumstances, it sure is convenient. Horses and Cattle and Snakes, Oh My! During the month of October 2015, Evelyn and I had a bit of a sabbatical out at Knights Rest here in central Oklahoma. This is a continuation of some of the things we learned during that month long camping trip and prepping hide away. We talk a lot in preparedness circles about Situational Awareness. We talk about how important it is to be aware of our surroundings, and what things within our area can potentially damage us. However, we don't spend much time and effort discussing situational awareness in the context of something bad happening to our gear, or what our plans are if Something Bad happens and leaves us whole and hale, but destroys something critical to our continued comfort or well-being. Twice during our trip, lack of situational awareness got the better of us. The first time, it cost us convenience and gear, and in the long run it cost Evelyn money replacing that gear. The second time, it could easily have cost one of us our life if we hadn't been lucky. The horses, dairy cattle, and sheep that are part of Knight's Rest have free roam of the entire 166 acres that it rests on. This is only fair, since it's their home, and grazing is a much more economical means of feeding ruminants than supplying endless amounts of hay. They don't typically wander into camp, preferring to stay in the "unoccupied" areas of the farm. At least, they don't usually wander into camp while people are there. This doesn't mean that they can't, or that they won't -- just that they usually don't. The Anatolian Shepherd farm dogs are a completely different story: they'll stick around camp if you're there, because you might give them treats! Or if you forget to put away the pound of bacon that you intended to cook for breakfast, and leave it laying on top of your camp kitchen table like a doofus (don't ask). So just what happens when you leave camp for a couple of days, thinking everything is secure? Well, if you're lucky, nothing at all happens, and you arrive back at camp two days later and everything is just how you left it. If you are not so lucky, you come back to camp to find that a 2500 pound horse with feet the size of a dinner plate has decided to walk through the middle of your camp -- and the middle of your tent! KR's horses are beautiful Shires and Shire/Arabian blends, which means they're draft animals. They're only slightly smaller than the Budweiser Clydesdales, in fact, and can easily stand as much as 6 1/2 feet tall at the shoulder -- and those are the dainty examples. This was the resulting damage to the tent poles: a 90 degree bend in a place that isn't supposed to bend at all! Both poles for Evelyn's original tent had a bend like that in it. While it was a nice little tent, and set up easy, and didn't weigh her down much, it could not withstand having a full size draft horse decide to walk across the space where it had been set up. Needless to say, that was one completely trashed tent. We were fortunate because nothing inside the tent was seriously damaged. A lot of it (practically everything, in fact) was soaking wet, because it had rained after the tent got stepped on, but otherwise everything inside was undamaged. Lesson Learned: Don't think that the relatively domesticated animals in your vicinity won't suddenly decide to come investigate you and your stuff. They probably will. Be aware of the relative sizes of those animals, and how much unintentional damage they can do in their fits of curiosity about this newcomer to their domain. October is one of those times of year in Oklahoma when the weather isn't cold enough to be considered "winter" yet (but it's closing in) and it's no longer really hot enough to still be considered "summer" (even though the temperatures can still reach the mid 80s on any given afternoon). One thing is certain about what passes for Autumn in this area: many animals are looking for a warm place to hole up in and sleep through til spring. And when I say animals, I also mean the slithery kind, like snakes and frogs and lizards. While we don't have many snakes here that are envenomed in a manner that is dangerous to humanity, we do have a few, most notably rattlesnakes of several sub-species. This includes pygmy rattlesnakes, which seem to have a Napoleon Complex, territorial aggressiveness, and the bad attitude you would expect from a grizzly bear with a toothache. Rattlesnakes love warmth. They don't move well when it starts getting colder, and will look for places to curl up where it's sunny and warm and comfortable. The piles of collected pine duff -- the fallen needles, etc that are scattered around in any given pine grove -- seem to be just the sort of thing that they're looking for, because of their high insulation value. 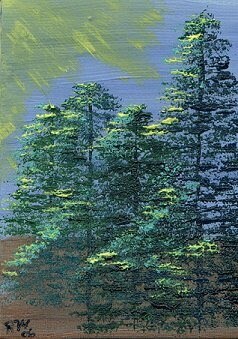 Our camp was in a clearing of a pine grove. Originally planted as a potential Christmas Tree farm project, it was allowed to grow wild when the project was scrapped, and natural clearings and glades were allowed to develop. One of these natural clearings is where I've chosen to make the Valeda's Grove (Wise Woman's Grove, for those unfamiliar with Viking and Norse usage) that is "my" permanent camping spot out at Knight's Rest. One of those sunny, warm, and comfortably-insulated spots created by fallen pine needles is about two feet off the path into camp. The trees form a bit of a natural arch leading into the clearing, and naturally funnel the flow of traffic in the area. One afternoon while we were out and about, one of those pygmy rattlesnakes decided to take up residence in the pine duff at the entrance to camp, two feet away from where we walked several times a day. Neither of us initially noticed the pygmy rattlesnake when we got back to camp. That's right, neither of the two women -- both armed, both relatively well-trained in looking after themselves, both familiar with camping and the various potential dangers that it can encompass -- noticed the venomous snake lying curled up and napping two feet from where they were walking. What alerted us to the danger (and pygmies ARE dangerous!) was one of the farm dogs alerting to the snake and us wandering over to investigate what had caught the dog's attention. Lesson learned: I learned several valuable lessons that day. I am still utterly terrified of snakes, even if I am armed, unless they are safely ensconced behind inch-thick glass at the Zoo. A .45 caliber bullet, placed correctly, will effectively rip a pygmy rattlesnake in half -- and it's rather satisfying in a strange, visceral way, to watch that happen. Even when it has been ripped in half by a .45 round, a rattlesnake will continue to move for a while, and will look like it's still attempting to strike. When in doubt about whether the snake is dead yet, beating it repeatedly with a BIG stick makes a satisfying thunk. A rattlesnake can only strike at things within a distance of approximately half its body length. I'm too much of a coward to get close enough to figure out how long a snake is in order to determine a safe distance. Always make sure you check the sides of the trail that you're walking, even (or perhaps especially) the trail into camp, to make certain you aren't missing something critical that could kill you. 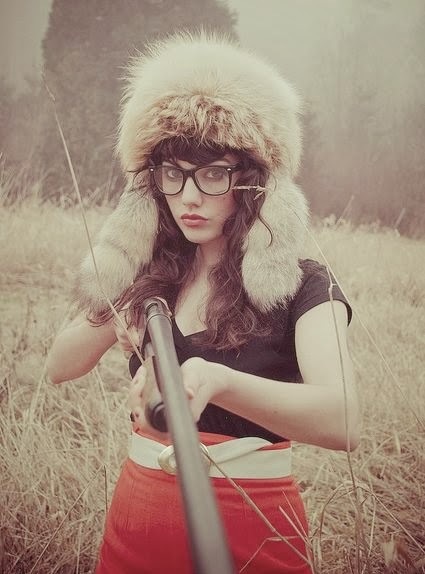 Evelyn is a good shot, and it's not wise to piss her off! She can hit a pygmy rattlesnake that's moving and attempting to strike (even though we were out of range) without flinching. Now that the furor over the Zika virus has died down, let's talk about more interesting things. Today I'm going to address what is the most commonly overlooked rifle accessory: a good sling. Most people think that a sling is just for carrying a rifle or shotgun, and while there's more to it than that, carriage of a firearm is their main purpose. But did you know there are different ways to carry? American Carry is the method most readers are familiar with. It's comfortable and you've seen it in countless movies. The major drawback is that the barrel is behind you and pointed upwards; if you're traveling though woods or areas with rocky outcroppings, it's easy for the barrel to strike or snag on the environment, and rain or snow can easily run down the bore and possibly affect the internal mechanisms. There's also discussion about how it's difficult to unsling a rifle from American carry quickly; I disagree. 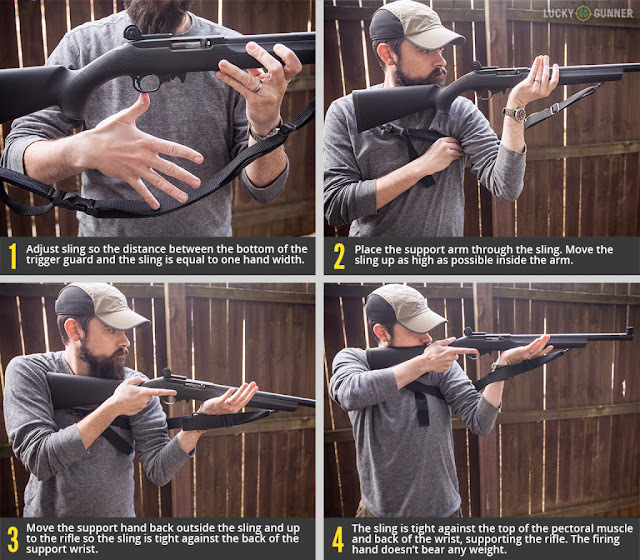 A little practice with (more if you're a klutz; less if you've been on drill team) and you can quickly shoulder it by grabbing the grip and rotating the rifle up onto your shoulder. However, this comes with the drawback of striking anything immediately behind you, or muzzling any companions to your rear. European Carry is just awkward. It's safest, due to being in the carrier's field of view, but also most tiring as the control hand shares the weight burden with the shoulder. This is the carry style I would use if I had to climb over something like a fence, but a better way around that is to hand my rifle to a buddy so had both hands free. 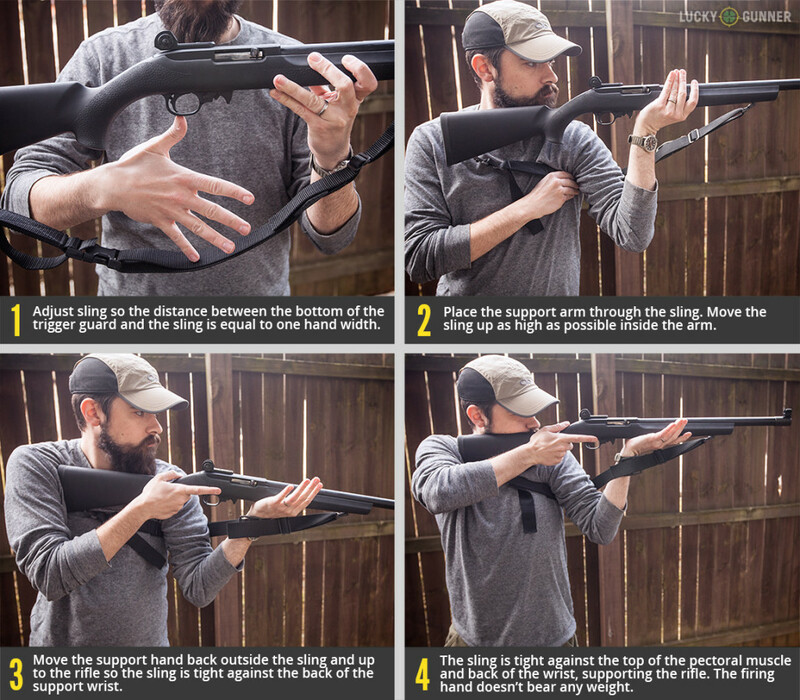 It has the same muzzle-up drawbacks as American carry, but it's also the fastest to implement the Hasty Sling technique (see below). African Carry is usually trumpeted as being the best form of carry: it's (allegedly) the fastest to unshoulder and raise into position, the barrel faces down and the carrier has visual confirmation of where the muzzle is pointing. On the other hand, if an African-style carrier trips, falls, or even kneels, that muzzle is going into the dirt and the bore could get plugged with debris. If you're curious how to quickly sling and unsling from African carry, here's a video demonstration. Slings aren't just for carry, though: they can also stabilize your rifle while shooting it. By taking up the slack with your support arm and tightening the sling across your chest, you essentially add a third point of support. In addition to helping hold your rifle steady, this is also a very comfortable pose that can be help for a long time. behind the bicep, and then across the chest before connecting to the other end off-panel. Instead of trying to explain with words how to hasty sling, I'm going to post two visual aids here: a video demonstration and a series of still pictures. I prefer the technique shown in the video, but have included the pictures as a backup (sometimes videos just disappear from YouTube). Picture courtesy of Lucky Gunner. Whichever sling you purchase is going to be a personal choice. That said, I recommend the Echo Sling by Matt Rogers: it's rugged to the point of absurdity, it comes in a variety of colors, it's very affordable ($19 to $20, plus $3 shipping), and it can even be used as belt/tourniquet/tow strap. I reviewed it on my personal blog a few years ago; you can read that review here. If you need more reasons to buy them, Echo Slings are made in the USA and are owned by a former serviceman who is also a gunnie. Disclaimer: Matt is a friend of mine, but I wouldn't mention his product here if it wasn't excellent quality. This is of course not an exhaustive article by any means. There are other methods of carry that do not require slings (over the shoulder, or in the crook of the arm), and there are other types of sling out there (single-point and three-point). 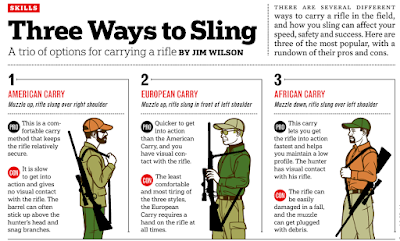 This is simply a discussion of the most common forms of carry using the most common type of sling, the two-point. I leave it to those people with more experience in the matter (like Lokidude and Firehand) to expand upon these edge cases if they wish. I've thought about starting a series of articles covering “Chemistry for Preppers” for a long time, and this is the first of a potentially long series. The depth of information will be determined by the feedback I receive from the readers and my fellow authors. If you didn't take or don't remember high school chemistry, a lot of this will be new information, but anyone with college-level chemistry will find it fairly basic. I am going to gloss over a lot of quibbles and minute details unless I am asked to be more precise; this is basic chemistry, after all, not Organic or Physical Chemistry. The first few articles will be basic chemistry with applied chemistry to follow. If you're interested in having an excellent reference book on your shelf, I strongly suggest the CRC (Chemical Rubber Company) Handbook of Chemistry and Physics. They're up to the 96th edition and they are expensive, but the information in them changes so slowly and in such small amounts that any edition you can find will suffice, so look in used book stores or second-hand shops around colleges for a cheap copy. You can find a lot of the history of each element in the Handbook, along with more data than most of us will ever need. The study of what things are made of started with the ancient alchemists, who were searching for ways to transmute (change) cheap, common materials into expensive, rare materials. In their search, they found that there were many different kinds of “elemental” materials that couldn't be broken down into anything simpler. These became the basic elements, and were organized into a table (see below) by how they acted and reacted, which led to the deduction that there were holes in the table and therefore undiscovered elements. Chemists searched for these “missing” elements for centuries, often competing with each other to be the first to isolate a rare or stubborn element. 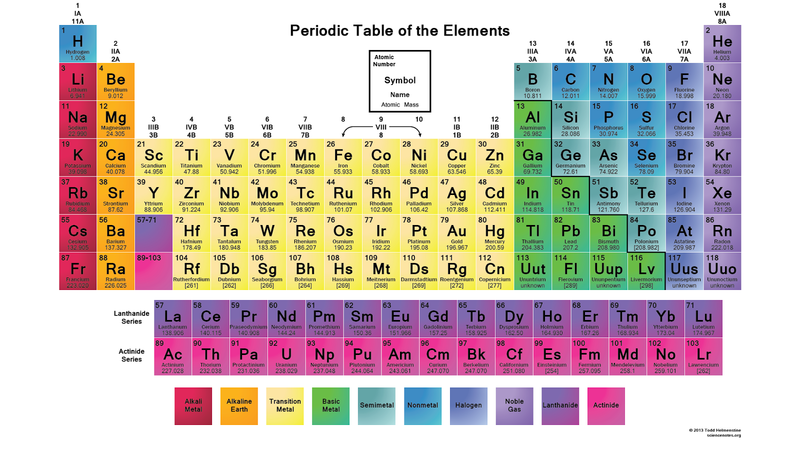 Everyone has seen the Periodic table of the Elements, but how many of you know how to read the information that's in it? A good table will give name, symbol, number, atomic weight, and sometimes other information. 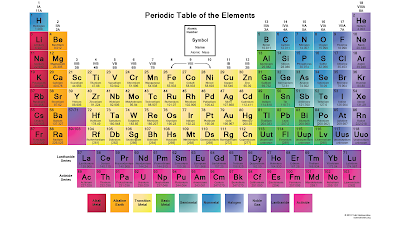 There are 92 naturally-occurring elements and 26 man-made elements. The man-made elements tend to be very radioactive and decay rapidly, normally small fractions of a second. The natural elements have names and symbols that are relics of the alchemists and the various languages spoken by the people who first isolated them. The man-made elements are often named after prominent physicists and physics labs. Some of the newer elements don't have official names and are referred to by their atomic number (in Latin) followed by the common -ium suffix. The vertical columns are called Groups, and the horizontal rows are called Periods. Groups share physical characteristics, with activity generally higher at the top and declining as you go down through the Group. Hydrogen is in a Group by itself, having no neutrons in the most common isotope. Alkali Metals react with water, stripping the oxygen away from the hydrogen and generating heat. Alkaline Earths are soft metals that also react with water. Metals, Transition Metals, and Semimetals are mostly solids that conduct electricity. Transition refers to electron behavior, and not the quality of metal. Semimetals are sometimes conductors and sometimes insulators, hence the "semi". Nonmetals are normally found tied to other elements, such as Oxygen to Nitrogen or Hydrogen. Halogens are very reactive, but Noble Gasses are completely inert and won't react with anything. Lanthanides are known as the “rare earths” because they are not very common in the Earth's crust. Actinides consist of naturally radioactive elements that decay through the release of atomic radiation (alpha, beta, gamma) to isotopes of lower elements. Periods are set by the configuration of the electrons in the various shells around the atomic nucleus. The innermost shell will only hold two electrons, The second and third can hold 8 electrons each, the fourth and fifth each hold 18, the sixth and seventh each hold 32. All matter is made of three basic atomic particles (sub-atomic particles are above my pay-grade). Protons are positively charged particles in the nucleus of the atom. The number of protons is the atomic number of the element. Since positive charges attract negative charges, there are generally an equal number of protons and electrons. Neutrons are neutral (non-charged) particles in the nucleus that weigh as much as protons. The number of neutrons added to the number of protons equals the atomic weight or atomic mass of an element. The number of neutrons can vary without changing the element, and these variations are known as isotopes of the element. The atomic mass of an element is usually given as an average of all naturally-occurring isotopes for an element, and is rarely a whole number. Electrons are negatively-charged particles that orbit the nucleus of the atom in distinct shells. Electrons have negligible weight and don't influence the atomic weight of an element. Electrons often move from atom to atom, and any time there is a difference in the number of protons and electrons, the atom is deemed an ion. That covers elements. Next week I'll start putting a few of them together and we'll cover molecules and atomic bonds. If I can find decent graphics I will use them; otherwise, you may be forced to suffer through my attempts to use MS Paint or something similar. 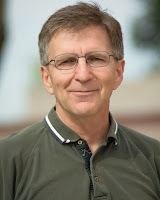 In a recent post to the Blue Collar Prepping Facebook page (join us, we have FUN! ), the importance of making and keeping doors secure was shown. The picture had the standard 3/4" door strike plate screws replaced with 3" long screws to attach the strike plate not only to the door frame, but also the wall framing hidden behind the door frame and trim. This is a great start to door security, but more can be done. At the very minimum, replacing the too-short screws with longer ones is a good start. Care has to be taken when installing the longer screws not to over-drive the screw. Splitting or warping of the frame can occur since there is usually no bracing at the level of the strike plate and the wall studs, and you could actually 'pull' the frame away from the door. 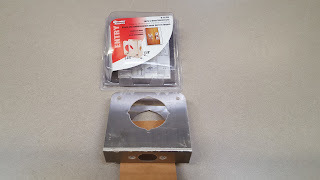 For those with the proper tools and knowledge, removing the door trim on the strike side will make placing extra shims or spacers easy, but will also complicate the the job. This is a picture of an interior door being shimmed from both sides. Doing this to your front door will increase the difficulty of the job (depending on the exterior finish of the house) and might be best left to a contractor. One of the easiest ways to boost security is to add larger strikes to the frame, which usually use more screws to secure the plate to the wall. One important point needs to be mentioned: the directions for these plates may not mention that removing extra wood to keep the finished plate flush with the surface of the frame is required! Mounting the new plate on the surface of the frame may keep your door from closing properly! Keeping your door held together is another point of security, and while not as clean and neat as the hidden strike plates, reinforcing the door itself at the knob is another option. 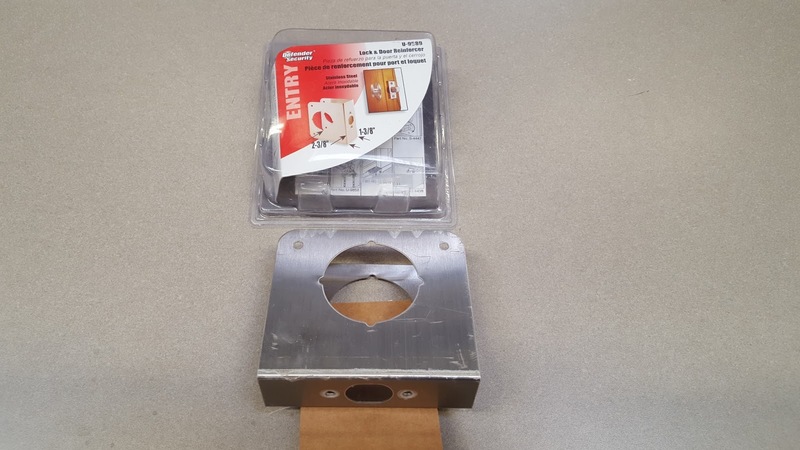 Using this reinforcement plate requires the distance from the center of the hole to the edge of the door (called setback) and the thickness of your door match to perfectly. 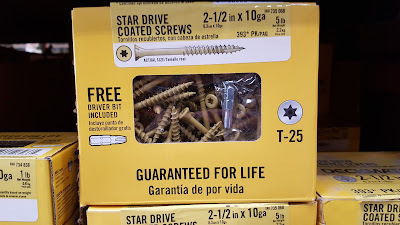 All of the screws included in the hardware kits (and most popular replacement screws) are Phillips type screws. Driving this type of screw with a standard driver/drill can, and usually will, strip the head of at least one or more of your screws. I personally use an Impact Driver to install long Phillips wood screws to prevent stripping heads. Here is a short video of the Impact in use for those not familiar with the tool. 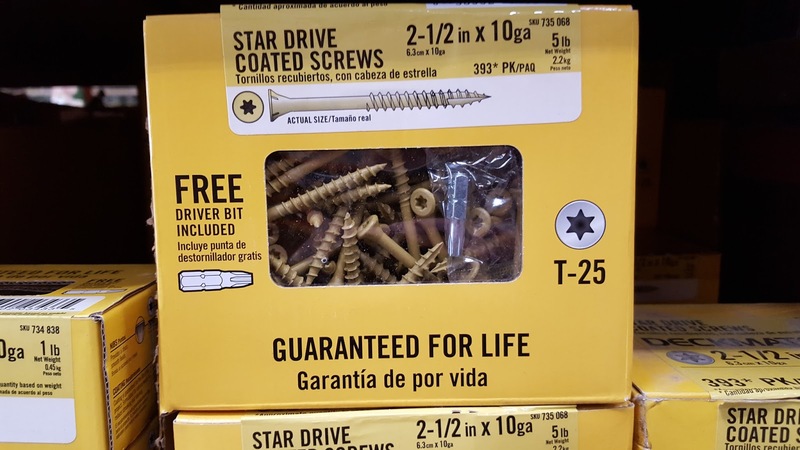 If you only have a drill, don't worry; there are some other screw options to consider with several different 'star' shapes being popular. Below is one of the oldest of the star types: the Torx head screw. Using Torx, Spax or other non-Phillips screw heads with your driver/drill will improve your attitude and speed up the job, in my experience. Shown for drive type. Use longer screws for the best results. Added security should be a priority. For very few dollars and little time, you can make a big difference. Matching your tools and materials to the job reduces headaches. I have not done these modifications to the house I'm in now because the landlord has quality lock sets already on the exterior doors! For those interested, the Makita Combo Kit is available from Amazon for $179 with Prime. 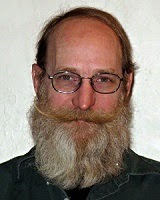 Check with your local tool dealers; occasionally you will find prices as good around town. As a reminder, any purchases made from Amazon through the links in this blog help pay for this site and do not increase your cost one penny! I've had a couple of incidents in the past week that have driven home the importance of safety gear, often referred to as Personal Protective Equipment (PPE). Between a shot to the safety glasses and some hearing damage, I got a much-needed refresher in wearing all the gear and making sure it all fits and is in proper working order. There are many types of PPE oriented at a wide array of hazards. While PPE is something you never want to have to rely on, it remains the last defense against injury when working in hazardous situations. After a disaster, when performing preventative maintenance, or when doing any other rough, dirty task, at least some PPE is called for. What PPE you select depends on the particular task and conditions. For most tasks, a simple, sturdy work boot will perform admirably. In especially wet conditions (such as following flooding), rubber boots or overshoes will let you work longer and more safely. Insulated boots are great in winter conditions, and good socks will keep your feet warm and prevent foot injuries. David did a great job covering gloves in Episode 39 of the GunBlog VarietyCast. There are virtually endless options when it comes to gloves, and he delivers a wonderful primer. Give it a listen, and if you still have questions afterward, ask away! I mentioned earlier that I took a shot to my glasses. We use rolls of spring steel to pull wire at work, and they get a bit out of hand when they're being coiled for storage. Getting smacked isn't uncommon, and thankfully I had my safety glasses on, or I could have easily done permanent harm to my eye. General-use eye protection is quite inexpensive, and mostly comes down to preference in fit, style, and lens color. The real thing to look for is glasses marked ANSI Z87.1 or 87.1+, because this is the testing standard used by OSHA to ensure proper protection. As a rule, you want your glasses to fit as closely to your face as possible, limiting the space for particles and debris to get to your eyes. If you wear prescription glasses, there are a few ways to deal with eye protection. If you wear contacts, you can simply use the same eye protection as folks without correction. There are also over-glasses or over-goggles, which fit over top of your prescription glasses (this is definitely the budget option). There are also prescription safety glasses available, usually from the same places you get your regular glasses. While not cheap, these are definitely the best-performing option. Purpose-made glasses like these tend to fit better, with a wealth of customization available. The other recent incident I had involved my ears. I went shooting with a friend over the weekend, and used some in-ear protection that ended up fitting poorly and providing little protection in one ear. I've had tinnitis for years, but this incident definitely advanced it, and left me with a "flat spot" in that ear. Any time it gets loud, you need to protect your ears. Earpro is available in both in-ear and over-ear varieties. For all but the loudest conditions, inexpensive foam plugs work wonderfully, assuming they fit your ear. If plugs don't fit in your ears, there are also muffs that work well. Muffs and plugs can also be paired to protect from more extreme noise. There are also electronic muffs available. These allow near-normal hearing under quiet conditions, but cut out loud noises before they hit your ear. Proper clothing is vital for preventing heat and cold injuries. Dress for the occasion.